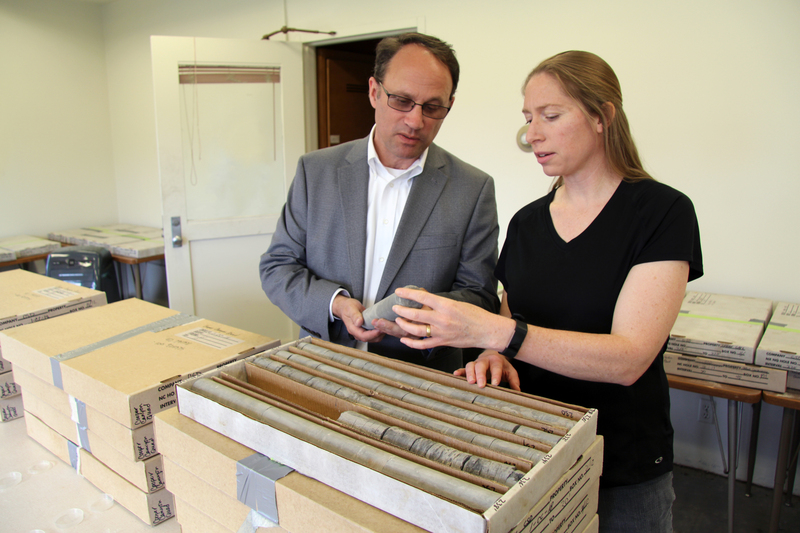 The Conservation and Survey Division at the University of Nebraska-Lincoln is working with a nationwide team of researchers to determine whether portions of Nebraska and Kansas may be suitable for permanently and safely storing commercial-scale volumes of carbon dioxide in rock layers deep underground. The long-term goal of the project, called the Integrated Midcontinent Stacked Carbon Storage Hub, is to create an infrastructure in the central United States that collects carbon dioxide from facilities generating high-emissions and delivers it to many possible storage locations. The work, led by Battelle, an independent research and development organization based in Columbus, Ohio, is part of a two-year, $13 million award from the U.S. Department of Energy for its Carbon Storage Assurance Facility Enterprise, or CarbonSAFE, initiative. The initiative is meant to demonstrate that secure geologic storage of carbon dioxide captured from high-emission sources is commercially possible by 2025. The Nebraska-Kansas project was the only project selected for a CarbonSAFE Phase II award that focuses on a regional hub storage solution; the other award-winners address carbon capture from single facilities. “One of the main reasons Nebraska is part of this study is because we are a major producer of ethanol,” said Dana Divine, CSD hydrogeologist who is partnering with State Geologist Matt Joeckel on the project. Currently, carbon capture from ethanol plants is the most economical option because the emissions are relatively pure in comparison to other sources, such as coal-fired power stations. Research assessing the capture, utilization, and storage of carbon dioxide has risen to the fore due to the recent expansion and reform in 2018 of a key tax credit called 45Q that incentivized carbon capture. Duguid explained that carbon dioxide reduces the viscosity of oil trapped in the geologic formation, leading to increased oil production and increased storage. Given the economics, the carbon dioxide in the IMSCS-HUB likely would be stored in both oil- and non-oil-producing geologic formations. In southwestern Nebraska and southwestern Kansas, CSD is examining whether two oil-field sites might be favorable for the storage of carbon dioxide. The researchers are studying the make-up of geologic units — about a half mile to a mile below ground surface ― that contain very salty water; those units are completely separated from the much shallower groundwater used for drinking and irrigation. The feasibility phase of this project is expected to be completed by the end of 2020, when CSD delivers its recommendations based on their findings.